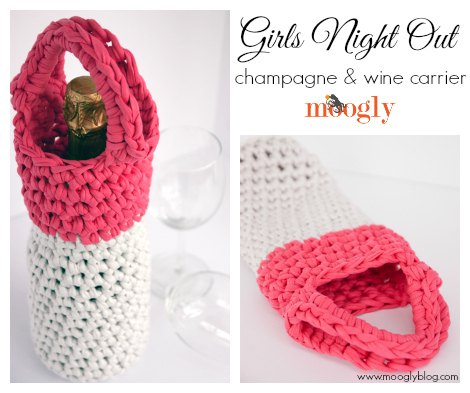 The Girls Night Out Champagne and Wine Carrier is the perfect project for any occasion you want to bring a bottle of champagne or wine to – picnics, a night out, dinner at a friend’s house, you name it! It works up in a flash, has a great modern color blocking look, and keeps the bottle safer in transit too! Recently I was able to get my mitts on some Lion Brand Fettuccini – in other words, premade t-shirt yarn! I love this stuff! Nothing could be faster or more fun to use for a quick project – it calls for a Q hook after all! You should’ve seen me in my local JoAnn Fabrics when I spotted an entire endcap of the stuff… I’m pretty sure the entire store heard my happy squee! 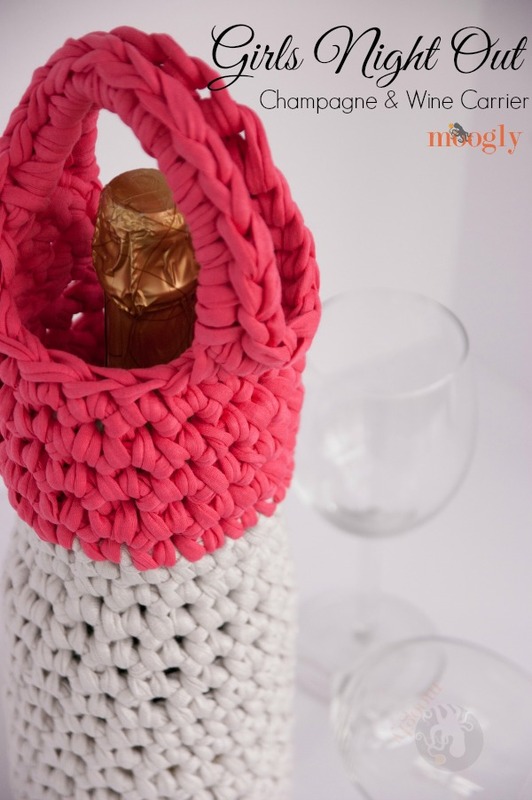 The Girls Night Out Champage and Wine Carrier is my first project with this yarn, and it’s super fun and easy to make – and did I mention fast? So fast! I love this big chunky look, and it’s so stretchy it works for both a standard size wine bottle and the fat bottom champagne bottles. I do love champagne, almost as much as yarn! This pattern can be worked in any colors of course, and you could even make your own t-shirt yarn. But for this project I chose a shiny silvery white and bold hot pink – just too fun! NOTE: From Round 4 to the end you’ll be working in spirals, without joining at the end of the rounds. Place marker (pm) in the first st of each round, moving it up each round as you work. Round 24: Sc in the first 2 sts, sc 12 in the ch sp, sc in the next 4 sts, sc 12 in the ch sp, sc in the last 2 sts; break yarn and use a smaller hook to create a seamless join to first st of round. Use this hook to “weave” in all other ends. And that’s all there is to making the Girls Night Out Champagne and Wine Carrier! I can’t wait to see what you all make with this pattern! This pattern and photos are copyright Tamara Kelly, 2014. Please share the link to share this pattern with others, but do not share, repost, or reprint the written pattern itself. You are welcome to print a copy or make a PDF for personal use only, using the green Print Friendly button below (click here for tutorial). You are also welcome to make items to sell from this pattern, but please link back to the pattern in your online listings and use your own photos to advertise your work. To get more Moogly in your life, connect with me on Facebook, Twitter, Tumblr and Pinterest! Thanks so much for reading! I am new to reading patterns for crochet. Could you please tell me what “pm in first st of round” for Round 4 means? I am not familiar with the pm abbreviation. Thank you! Thanks for this pattern. 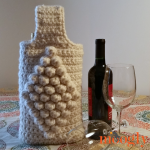 I’m not a big alcohol drinker but I still have a use for the pattern… a waterbottle holder! There are two bottle in the back of my car that drive my CRAZY with their rattling. This will stop the sound and keep the water cool (there situated right over the motor which makes them get extremely hot in the spring/summer). THANKYOU!!!! 😀 I’m glad you like it!! WHEN YOU PUT UP ON YOUR SITE A CROCHET PATTERN WOLD YOU BE ABLE TO ALSO PUT UP SAME PATTERN KNITTED IF POSSIBLE PLEASE . Hi Dorothy! Not every pattern translates well to both knitting and crochet, and I’m not as skilled at knitting as I am crochet. Thank you for this pattern. My girlfriend is a big wine gal and this will make a great Birthday gift for her come August! Lovin your blog! 😀 Thank you Becky! I’m so glad you like it! i would love to make this and it is very fancy + easy!! i am having a steal bottle which falls on the floor 1000 times in one day so this is a type of a great ”air bag” bottle-cover which can cover preserve the bottle and helps it, not to change its shape! 😀 Glad you like it Marrie! I’ll have to look for this yarn. I have been making bags like this for wine/champagne/water bottles for years out of cotton worsted weight (it soaks up condensation in hot work places quite well). You can also make it work for oblong bottles by making a base chain and working both sides of the chain around. I often finish my rounds off, not working in a spiral, but either way it can make a lovely gift out of a simple bottle. 😀 Thank you Ann, I’m so glad you like it! What a great idea. 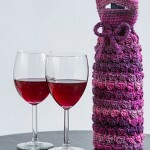 I’m thinking it would make a great wine bottle gift bag too! 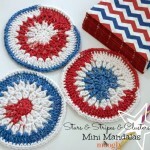 I am good up until I get to Round 4 – I am new to crocheting. When I start the BLO I actually get 22 stitches why is that? If I keep going when I have to change the yarn @ Round 17 – it is not even. So I am definitely not doing something right. Hi Maura! I’m not sure where you’d be picking up that many extra stitches! You could be crocheting into the sl st that joined the end of Round 3, but that would only account for 1 more. Are you using a stitch marker to help you remember which stitch is the first of each round? 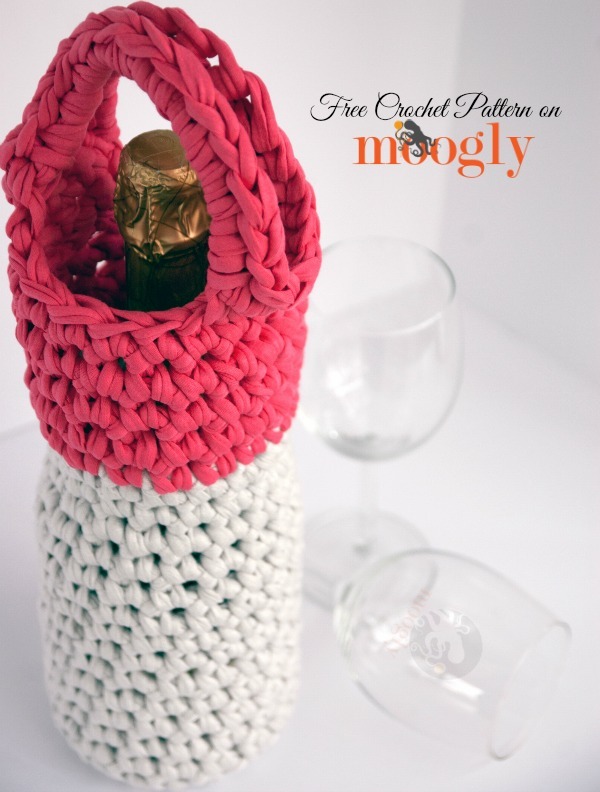 I love this pattern and am determined to make the wine bottle holder. I am having trouble with having enough yarn in one skein to make this. I have made it three times with different hooks/deleting a few stitches etc and the furthest I can get is 17 rows using an “M” hook. I even measured the yarn in the skein and there are exactly 55 yards. I do not crochet loose and usually can get the gauge without trouble. Any suggestions? I really would like to make about half a dozen of these wonderful carriers. Any help is greatly appreciated. Unfortunately the yarn I picked out is a pattern and haven’t been able to find anything to coordinate with the colors in the yarn to finish the one that is done through round 17 but I will keep looking. Thank you for the inspiration!! Hi Heidi! Sorry you’re having trouble! I do wonder if the fabric in your yarn is stiffer? That’s all I can think of off the top of my head. It does stretch quite a bit though – at least mine does – so maybe you could drop a few rows altogether? That must be it, the store I bought the first 2 skeins from only had 2 skeins and they are very stiff and do not stretch at all. The next 2 skeins I bought at another store had quite a few skeins and there was a big difference in the stretch of the yarns so I purchased the “stretchier” skeins the second time. I will let you know how they turn out. Thank you for your help!! Used the stretchier yarn and it worked perfectly. Thank you!! Oh good! Glad to hear it, thanks! I had the same issue as Heidi! Using a plastic q sized hook, I couldn’t get more than 15rows. I ended up going with 12 rows and made a super long handle. My fettuccine had barely any stretch to it. I think with non stretchy skeins, a person would need 2 skeins to make this carrier. Sorry about that Sharon, thank you for the feedback! Fettuccini is a bit of a toss up! I got tired of waiting for my local yarn store to carry this yarn, so I used this tutorial to make some of my own…http://www.craftpassion.com/2009/05/recycle-tutorial-making-of-t-shirt-yarn.html/2 . It does come out a bit thicker than the Fettucini, so I had to do less rounds but it still worked very well 🙂 I ended up with a 4″ diameter circle on the bottom, and only had to do 14 or so rows of first color, and then 4 of the second color before making the handle. Awesome solution! I’ve made plarn, but haven’t tried making tshirt yarn yet. Love this and such an easy pattern to follow until I got to the end of round 23 I didn’t seem to have enough stitches to skip 5 and sc in last 2 but I improvised and it turned out just fine. Going to love making these. Thank you! 😀 Glad it worked out Andrea! Thank you! Love your pattern idea. checked with JoAnns and no T-Shirt yarn. Where can I purchase T-Shirt yarn??? Thanks for the response. Went to Lion Brand but they will not let you select your color and can’t find Super Bulky 11oz on line. Do you only do one row 4 in the BLO? Yes, just the one. 🙂 Creates a nice edge for the base! I am good up until row 23 (the handles). Do you have a video that I could view? I just don’t seem to be getting it. HI Deb! Sorry for the confusion! I don’t think I have a video that would apply here, unfortunately. What part is tripping you up – chaining, skipping stitches? just want to learn basic crochet. I love this and can see Christmas gifts on the horizon. But now I’m on row 24 and stuck. I’m new to crochet, only made a couple of baby blankets but they turned out pretty well.. I thought I was doing really good until I got to row 24. I’m totally confused. You say “Round 24: Sc in the first 2 sts, sc 12 in the ch sp, sc in the next 4 sts, sc 12 in the ch sp, sc in the last 2 sts”. This row has me stumped. I got the SC in the first 2 sts…I get that, it matches it up to what the other side looks like. We chained up 10 for both handles, so the “sc 12 in the chain space” has me stumped. Are these sc’s going up across the handle?..and there was 10 chains not 12. I’m sure I’m just not seeing it as it’s after 2 am but this was moving so fast I wanted to finish it before I went to bed. 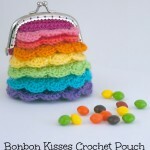 I loved this, when I first seen the pattern I bought a small “lot” of tshirt yarn off ebay to try it. Am mad at myself that I have to go to bed without it being finished. You were right, it was very fast and looks great… Being a long time crafter I’ve already watched many of the YouTubes on making the tshirt yarn so I’m going to make my own to get the colors I want for holiday gifts. Just need to get past the last row 😉 thanks!!! Hi Aneve! Sorry for the confusion. Yes, you crochet those 12 sts across the handles – around them though, not into the actual chains. Hence the greater number of sts than chains – I find they look better and cover the chains better, but you can work just 10 if you prefer that look. My problem is with row 24 too. I am not sure I understand what you mean by stitching around the stitches. And I also went ahead and tried to “guess” row 24. I know my tshirt yarn is thicker than what you used as it was made and sold on ebay and wasn’t the brand name you used…but my handles looked nothing like yours at all, and my space between my handles looked wider than the picture of yours. Maybe I need to undue the whole project and start over. I couldn’t stitches until I got to row 5…and since there was no chain one, I just moved my pm up and went on. All I kept count of was what row I was on…but maybe I didn’t something wrong…but mine looks just like yours except for color and the fact my tshirt yarn is thicker. I’m also wondering if maybe using a P hook might look better with what I have… I think mine is right except row 24, which I’ve already took back out. thanks for your help and hope youre having a great 4th weekend!! Hi, I just discovered your pattern and love it. Is it suitable for other types of yarn or only tshirt yarn? Also, I’ve never come across a 19mm hook. Can I use a smaller hook with extra stitches and have it still work? What a great and simple pattern. Thanks! What do you mean by “pm in first st of round” in round 4? Also, could you provide the height up to the handles? I’m using “plarn” so the gauge is a bit different and I want to make sure I make it tall enough (no wine bottle around, darn it! lol). Thank you! I figured out the “pm” after I posted. lol 10 inches works – I’m at 9 1/2 inches right now. 🙂 Is there a way to share photos in the comments? Would love to show you the outcome. I’ve become a “plarn” (plastic grocery bags made into yarn) addict lately and this is the perfect pattern for one of its many uses. Thanks! Just finished it. I’ll see about taking pix later. Dear Tamara, thank you so much from Switzerland for this lové l’y pattern! ? So I’m a little confused because a US Q hook is Q-19 15mm and the US S hook is 19mm, so do I use the Q hook or the S hook for this pattern? Hi Dani! This calls for a 15.0 mm (P/Q). 🙂 I apologize for the confusion!